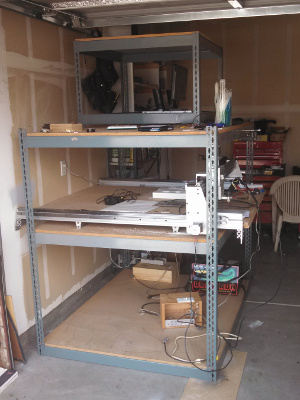 Building my own CNC machine. Really. When the weather isn't nice enough to work on my car, and I'm not feeling inspired to weld, I work on electronic gizmos. 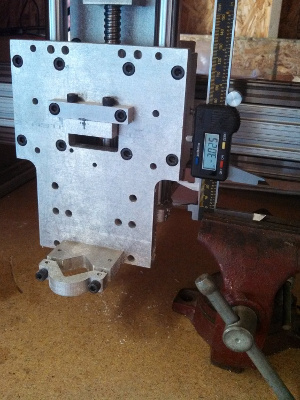 This section of my blog is dedicated to the build-up of my CNC machine. I currently have a fully operational 4x4' CNC machine! Here it is fully assembled in the garage. 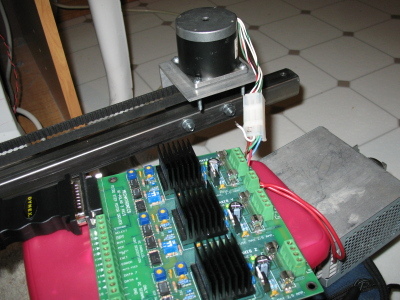 It's using the G540 motor controller, connected to NEMA23 motors. Here are the motor control wires, cobbled together to make sure it works. Calibrating the machine with an electronic gauge. Every CNC machine needs a panic button. Here is mine. After quite a bit of cobbling and rigging things together, I got the Y-Axis working. 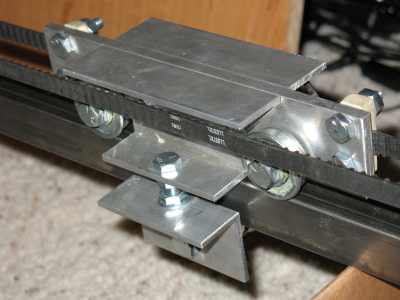 I used a plywood base, and used cut sections of 2x4s to mount the far roller-bearing, and used a piece of plastic cutting board to mount the near roller-bearing. Here's the motor mounting block -- you can see that the motor is not screwed to the blocks yet. 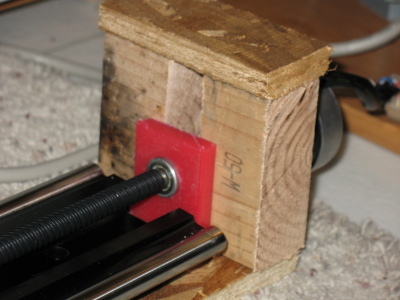 Here you can see the cutting board where the roller-bearing is mounted. This linear actuator uses a lead-screw instead of a belt like the X-Axis is using. It feels more solid and precise, but I don't know if it actually is. In any event, here's a video of the Y-axis is motion. 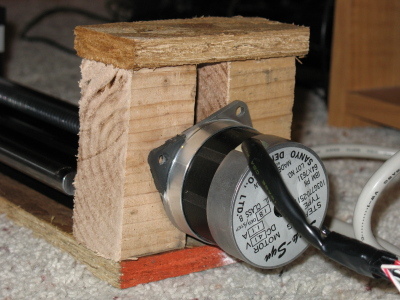 The motor is not fully mounted to the wood base yet -- that's what's causing the knocking sound. After buying a few wrong cables (it turns out that you cannot use a parallel-to-USB adapter) and collecting as much information as I could from the CNC Zone forum, I made some tremendous progress on the CNC machine. 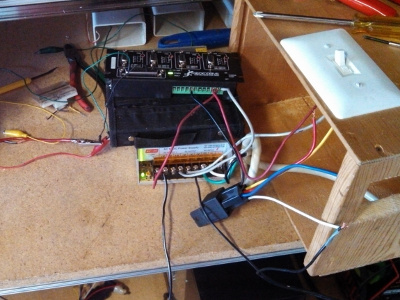 The first thing I had to do was to figure out how to wire up the stepper motor to the controller board. The board has 4-pin terminals for the motors, but the motors I purchased were 6-wire motors, so it took me a while to figure out which wires were unnecessary, and then what order the wires need to be to work with the controller. I went through nearly every configuration possible before I read that you can control the voltage going to the motors by turning a surface-mounted potentiometer. I had nearly no voltage to the motor, causing the motor to hum, but not actually do anything. Once I figured out the problem, I set the proper voltage and got the motor to move. 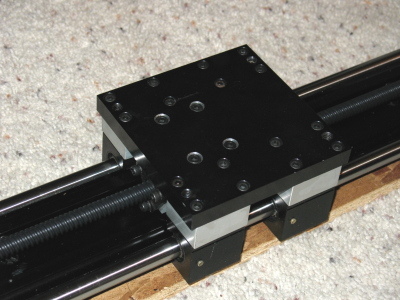 I currently have the X-Axis of the CNC machine set up. After getting the motor to run last night, I figured it was now time to get the X-Axis to move. Now that the X-Axis is complete, it's time to start building the table, and mounting the Y-Axis on top of the X-Axis platform. I received the power supply for the CNC machine I'm building about a week ago, and it's a bit smaller than I thought it was going to be. That's good - smaller is better. I had to do a little research to figure out how to wire a power cord to the little box. The power line I used was from an old computer cable I had sitting around, and inside that cable was a white, black, green, and bare ground wire. The power supply had a spot for ground, "L" and "N", which I determined were for "lead" and "neutral." Ground: bare wire and green wire. Alternating current is so weird. DC is so much easier, with it's easy-to-remember black and red wire. 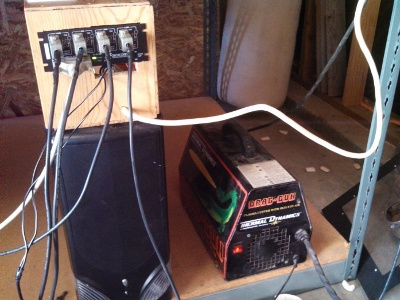 I tested the power supply with a multi-meter, and it's pushing out a full 24 volts. Good deal. 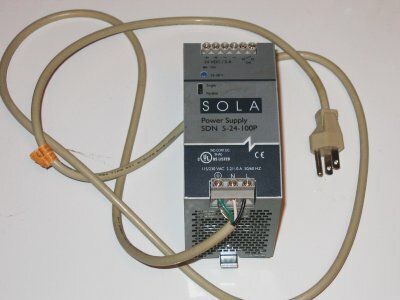 After reading through the manual for the CNC controller board I picked up on eBay, I discovered that I needed a 24v/2-6amp power supply. 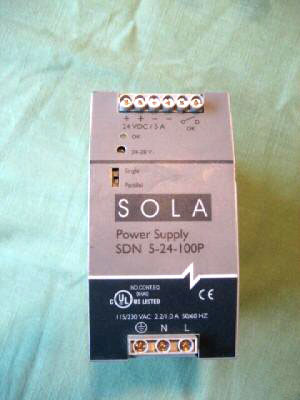 And then I discovered that such a power supply isn't exactly cheap unless you want to build one yourself. From the start, I really wanted this to be a DIY project. I wanted to feel like I put this thing together myself and only ended up spending 1/5th the cost of an actual production CNC machine. However, trying to navigate through the the time/money continuum has been really tricky. I'm eating up tons of project time working on other projects that make money instead of cost money, so... I feel justified taking money from one project and dumping it into the other. It just feels more efficient. That said, I picked up a power supply on eBay for $58 after shipping. I could have gone cheaper and gotten an unassembled power supply, but the idea of being the grounding point for 24 volts and 5 amps (ie., DEATH) doesn't really sound appealing. So... I decided to go the safe route by purchasing a completed unit.